Health writers are no different. They craft their headlines to grab your attention; they want you to be captivated so you will read the full article. Now, make sure the content has substance and accuracy. I was curious to find out what I’d find on Google regarding the recent noise about the possibility of coffee lowering the risk of stroke. 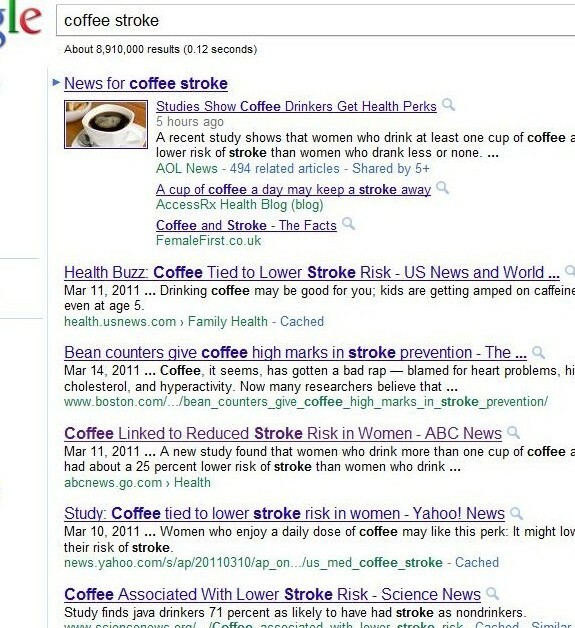 I typed in “Coffee Stroke” and received “about 8,910,000 results.” Most of the articles had compelling headlines. These headlines may be compelling, but does the content support these headlines. Is the information accurate? How to go beyond the headlines. Gary Schwitzer, publisher at HealthNewsReview.Org is brilliant at dissecting health stories for accuracy. He helps journalists and consumers understand the importance of accurate and balanced news stories. As a smart health consumer, ask yourself, does the content in the article support the snappy headlines? Schwitzer offers a “tool kit” for journalists and consumers to help decipher a health news story. It was a big study, but an observational study. Not a trial. Not an experiment. And, as we say so many times on this site you could almost join along with the chorus – observational studies have inherent limitations that should always be mentioned in stories. They can’t prove cause and effect. They can show a strong statistical association, but they can’t prove cause and effect. So you can’t prove benefit or risk reduction. And stories should say that. “The problem with this type of study is that there are too many factors unaccounted for and association does not prove causality, said Dr. Larry B. Goldstein, director of the Duke Stroke Center at Duke University Medical Center. “Subjects were asked about their past coffee consumption in a questionnaire and then followed over time. There is no way to know if they changed their behavior,” Goldstein said. And, he noted, there was no control for medication use or other potential but unmeasured factors. When you don’t explain the limitations of observational studies – and/or when you imply that cause-and-effect has been established, you lose credibility with some readers. And you should. USA Today wasn’t alone in being incomplete. WebMD was just plain inaccurate when it stated: “1 or More Cups of Coffee a Day Reduces Stroke Risk in Women.” The study didn’t prove that. But why even go there to begin with? ABCNews.com, by comparison, emphasized this study showed “association, not causation.” Kudos to them. For anyone – journalist or consumer – or researcher, for that matter – who doesn’t grasp the importance of using the correct language to describe observational studies, please see our primer on this topic. We would love to hear from you. Please share your insights in the comment section below. Are you captivated by the headlines? Do you trust completely that the health news story you read is accurate? Do you dig deeper to find out what’s behind the headlines?